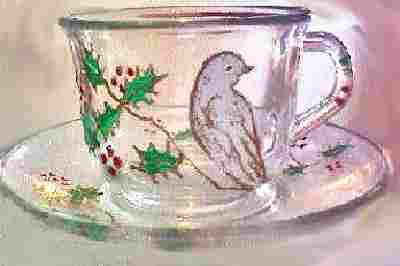 Festive Christmas white dove hand painted on coffee cup, the sign of peace is perched elegantly on a branch as the theme of this cup and saucer is a calm soothing holiday design. 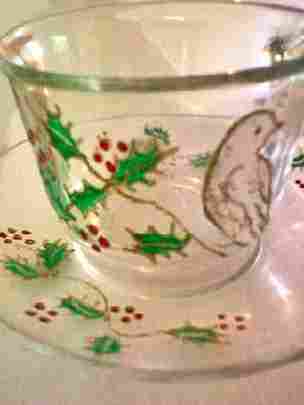 The set makes a perfect holiday gift or you stay warm with your favorite hot beverage in our hand painted white dove cup and saucer while curled up by the fire. 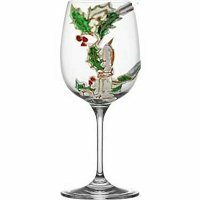 If you like the Christmas White Dove design than see other pieces of glassware in Options. If ordering different quantities of products, place each different product in cart separately.